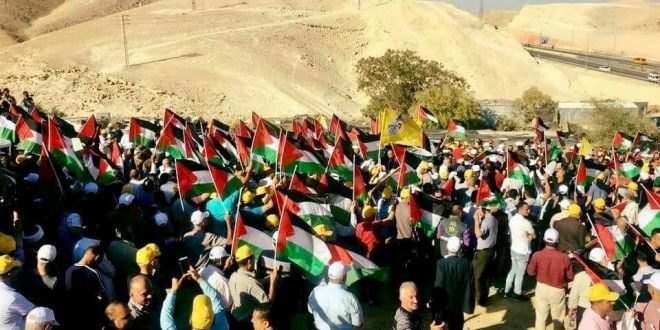 Thousands of protesters on Wednesday held a protest against the Israeli plan to demolish Khan Al-Ahmar Bedouin village and replace it with illegal Israeli Settlement units, by waving Palestinian flags and chanting slogans. Head of the Wall and Settlements Resistance Authority, Walid Assaf spoke to the residents of Khan al-Ahmar, ensuring them that the protesters who arrived for solidarity will not stop supporting the village until the demolition plans have ended. Speaking at the rally, Fatah deputy chairman Mahmoud Aloul praised the steadfastness and perseverance of the residents of Khan al-Ahmar in spite of all the Israeli measures to force them out of their land.